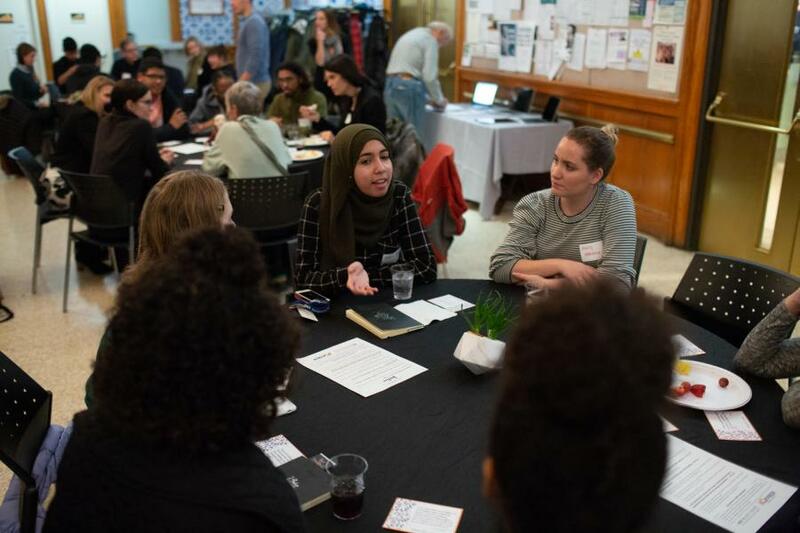 The event was part of the Ben Franklin Circles (BFC) through which people get together to explore how to improve themselves and the world through the lens of civic virtue. By practicing civic virtue, Franklin believed we could be better people and better citizens. Circles use Franklin’s 13 Virtues to spark discussion about members' goals and aspirations — who they want to be, and what they want to contribute to the world. As part of the iCivics Democracy at Play adult civic learning challenge, attendees also had the opportunity to sample iCivics’ interactive games and learn more about the organization. Each table had a mix of guests, including students from area high schools, and adults from the community. In this day of quick sound bites and commentators yelling at each other on the news and via social media, the idea of lengthy conversations on a single topic and actually “listening” to each other is becoming more and more uncommon. Attendees enjoyed sharing personal stories and sitting back and listening. Groups had lively dialogues and reflected on the virtue of justice. People put away their phones to have a meaningful conversation and the high school students led the closing discussion, getting up to share their thoughts with the whole group. It was inspiring and we hope to host more of these. Click here for more information on the iCivics Democracy at Play campaign. Click here for more information on the Ben Franklin Circles.